These five girls represent Collinsville's fastest 2 mile relay team. Coach Anderson said he had his toughest coaching decision ever deciding which 4 would run in the state finals Saturday (May 7th). L-R: Jessica Keith, Johna Moore, Jeannette Lykins, Kylie Pelizzoni and Hillary Conyers. These girls beat all other 4A state competitors to bring home Collinsville's first girls track 1st place state finish (at least as far back as 1985 per Terry Due's recollection). Collinsville finished in second place last year. CHS Baseball team plays Berryhill 7:30pm Thursday (at Shawnee). CHS Girls Tennis: Kerry Schultheiss and Katie Cruger competed at the state tournament last week (having finished 4th at regionals). Emily Richardson and Amy Schultheiss just missed out on a trip to state with a 5th place regional finish. 5/27/2005 Update from Coach Irvine on the Girls Golf team's sixth place finish at Lake Hefner in OKC (and several tournaments before that). 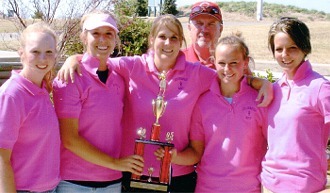 Crove Golf Tournament Golf 3rd Place (L-R) Toni Slagle, Amber McElroy, Valerie Hart, Erica Holly and Heather Hampton (April 4th, 2005) in front of Coach Stan Irvine. According to the O.S.S.A.A. web site Elk City won 1st place with a team total of 699, Bishop McGuiness 2nd (717), Hilldale 3rd (725), Pauls Valley 4th (725), Guymon 5th (731), Collinsville 6th (733), Harrah 7th (794), then Mannford, Sallisaw, Okmulgee, Fort Gibson and Clinton. Coach Stan Irvine said the girls were red hot on the front nine but couldn't sustain it on the back nine but still had an outstanding tournament. L-R Front Row: Kelsi Miller, Jordan Perkins, Amanda Boline and Jessica Dyer. Back Row: Katie Hoffman, Jessica Keith, Jeannette Lykins, Johna Moore, Hillary Conyers and Kylie Pellizoni. Idabel finished first with 86 team points, OKC Douglass 2nd with 66 points, Collinsville 3rd with 44 points, OKC McGuinness and Edmond Deer Creek were 4th-5th each with 36 points. The meet was held at Moore, OK.
Collinsville lost to Berryhill 3-6. Berryhilll lost to eventual State Champs Oologah in the finals. The CHS Girls Golf Team won the Tulsa 7 Conference Championship (above) May 18th. They won the regional championship April 27th and finished 6th at the 4A State Tournament May 4-5, 2005.